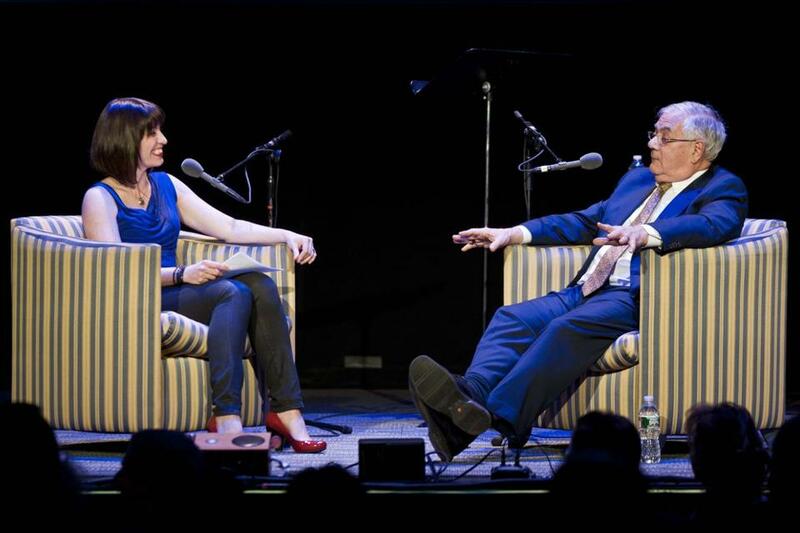 Ophira Eisenberg chats with Barney Frank during the NPR taping. The New York-based NPR show “Ask Me Another” taped its first live performance on the road for a Boston audience on Monday night. Fans of the program, who packed the Wilbur Theatre, got to see host Ophira Eisenberg do some stand-up comedy and then quiz a pack of locals, including three celebrity guests, former Congressman Barney Frank, “The Giver” author Lois Lowry, and Pulitzer-winning film critic Wesley Morris, formerly of The Boston Globe. Highlights of the taping — which will air in May — included house musician Jonathan Coulton’s performance of his song about Brookline, Morris’s inability to ring his buzzer during a movie trivia game, and Lowry telling Eisenberg that she loves the movie “Fargo” — and then quickly admitting to the audience that she’d have to run home and change all of her passwords now that the world knows her favorite film. Eisenberg admitted to us on Tuesday that she was a bit nervous about interviewing Frank, who she knew would be outspoken if he wasn’t happy. But he liked the show — and Eisenberg. “He was in great spirits. He had about 1,000 great lines.” Frank participated in a game where he had to determine whether a quote was from him, Michele Bachmann , or Kanye West. If you’re curious about how he did, you’ll have to tune in next month.